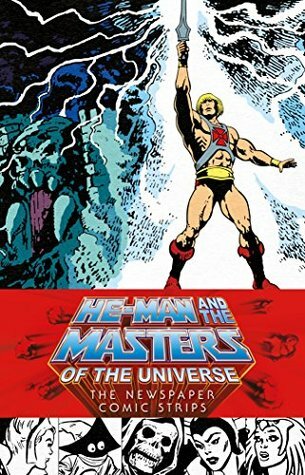 What is it about He-Man and the Masters of the Universe that it manages to have a lasting appeal? I was not aware that there had been a newspaper comic strip (daily and Sunday). 1,674 days worth of comic strips. So when I saw that Dark Horse gathered as many of these strips as possible (all but thirty-five are reprinted and of those that are missing a synopsis of the story is in its place) I was eager to get my hands on this. A daily comic strip is a very unique and challenging way to tell a story but as you read through this volume you come to see that authors Jim Shull and Chris Weber and artist Gérald Forton did a really remarkable job telling stories in this method. It becomes even more impressive when we learn through the different interviews included that these stories had to be cleared not just from the editor and publisher, but also by the controlling toy company that often wanted to feature a new item that would soon be for sale. The interviews here are with Weber, Forton, colorist Connie Shurr (the early colors in the Sunday strips are quite remarkable and notable), and strip editor Karen Wilson. There’s something in our culture that appreciates heroes who act with fairness, justice, equality, and compassion. Although powerful, He-Man and She-Ra look out for the needs of the marginalized, the suffering, those seeking justice. They use their power for good, not evil. They are not self-serving. They only use violence as a last resort. They use their smarts and their wits. … They are also brave. Strong. And still have a sense of humor. This was a really fabulous read and it deserves to be on every shelf of every comic book, comic strip, television/media fan who enjoys a good story with wonderful art.